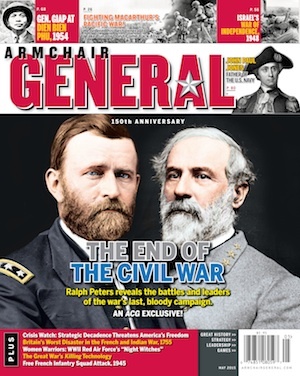 Armchair General and the Colby Symposium in 2014 | Armchair General Magazine - We Put YOU in Command! Armchair Gen eral will again support the 19th annual William E. Colby Military Writers’ Symposium, to be held at Norwich University, Northfield, Vermont on 9-10 April 2014. As a part of the symposium the eighth annual Armchair General Award will be presented at a dinner at Norwich the evening of 10 April. Col. Douglas Macgregor, USA (Ret): A decorated combat veteran, businessman and the author of four books, Macgregor’s innovative concepts from his Breaking the Phalanx and Transformation Under Fire have sparked discussion and influenced thinking about transformation inside America’s ground forces. Macgregor was awarded the bronze star with V for Valor for his leadership under fire of combat troops in the 2d Armored Cavalry Regiment during Desert Storm. After Desert Storm, Macgregor commanded the 1st Squadron, 4th Cavalry, and later became director of the Joint Operations Center at Supreme Headquarters Allied Powers Europe (SHAPE), a position from which he supervised the planning and conduct of operations during the Kosovo Air Campaign. Jack Segal, Consul General of the U.S. (Ret. ): A decorated combat veteran, Mr. Segal served as the principal foreign policy and political advisor to the NATO Joint Force Commander. He has travelled frequently to Afghanistan since 2002, meeting with senior Afghan, ISAF, U.S. and other NATO officials. A Vietnam veteran who was awarded the Bronze Star and Meritorious Service Medal, Mr. Segal resigned his Army commission in 1977 to join the U.S. diplomatic service as a Foreign Service Officer. He served as State Department representative to the U.S. START delegation at Geneva, Chief of Political/Military Affairs in Tel Aviv, established a new United States Consulate General in Yekaterinburg, Russia and was named the first U.S. Consul General to central Russia. He served on the National Security Council at the White House as Director for Russia, Ukraine and Eurasia and later Director for Non-Proliferation. He received four Superior Honor Awards and three Meritorious Honor Awards during his State Department career. Maj. Gen. John Borling, USAF (Ret), a fighter pilot in the Vietnam War, spent 6 and a half years as a POW in Hanoi after being shot down. Upon his release, he served as an F-15 Eagle fighter pilot, Air Division commander at Minot AFB, and Head of Operations for Strategic Air Command (SAC) in Omaha. He led the classified think tank CHECKMATE, was director of Air Force Operational Requirements, and later served at NATO’s Supreme Headquarters in Belgium. He was central to the creation of HQ North in Norway, serving as Chief of Staff. Borling has been awarded the Silver Star, two Bronze Stars with V for Valor and two Purple Hearts. Other medals include: Prisoner of War Medal, Distinguished Flying Cross, Legion of Merit, Defense, Superior Service Medal, Air Force Distinguished Service Medal and the Defense Distinguished Service Medal. In 2013, Borling published Taps on the Walls: Poems from the Hanoi Hilton, a collection of poems written during his imprisonment. Stephen Pomeroy is currently serving as the Associate Director and Lecturer, School of Business & Management at Norwich University, where he teaches three undergraduate courses: “Introduction to Business,” “Organizational Behavior,” and “Organizational Leadership.” While on active duty, Pomeroy served as the Dean of the School of National Services and the Professor of Naval Science at Norwich University. As a Marine Corps leader, he served as Commanding Officer of a carrier-based F/A-18 Fighter Squadron from 1997-1999, and Commanding Officer of a Marine Aircraft Group from 2002 to 2004. Pomeroy participated in exercises and combat operations across the globe and has extensive operational and combat experience. Pomeroy will moderate the 2014 panel discussion. Established in 1999, the Colby Award recognizes a first work of fiction or nonfiction that has made a major contribution to the under-standing of intelligence operations, military history, or international affairs. Through the generous support of Col. J. N. Pritzker (Illinois National Guard, Ret.) and the Tawani Foundation in Chicago, the winner of the Colby Award receives a $5,000 honorarium. The winner of the 2014 Colby Award is historian Logan Beirne, for his book Blood of Tyrants: George Washington & the Forging of the Presidency. In 2007, Armchair General founder and publisher, Eric Weider, and Editor-in-Chief, Jerry D. Morelock, began an association with the Colby and Norwich University. Armchair General donates $500 annually (a figure matched by Norwich) to an outstanding student in military history who enrolls in the Norwich Master of Arts in Military History online graduate program. The award will be presented at the Colby Symposium on April 10. In addition, Armchair General is also donating 100 free copies of the magazine for interested Norwich faculty, students and conference attendees. Our sincere thanks to both Eric and Jerry for their generous support. It is yet another example of ACG’s growing contributions to the field of military history. After the event, a limited number of autographed 2014 full color Colby posters will be available for sale, each signed by the authors attending this year’s event. Posters from previous years are also available at a nominal fee. Contact is Lindsay Cahill Lord.